'Tis the season... for MAYHEM! 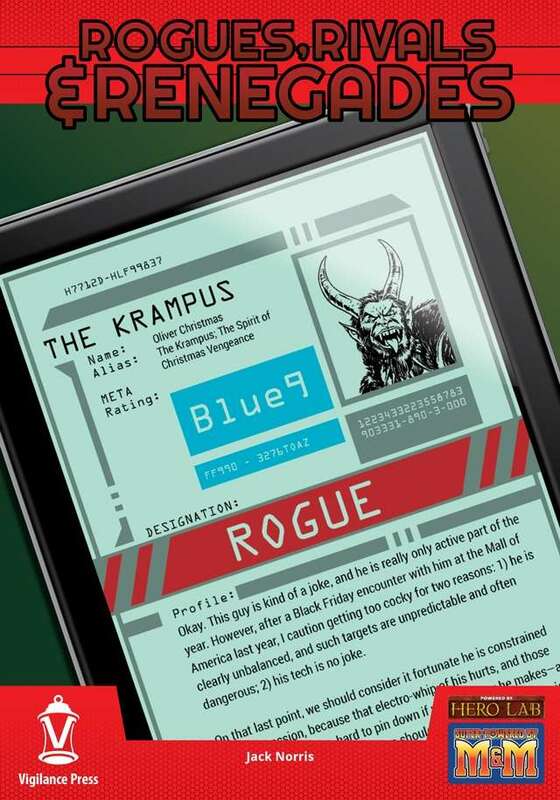 The Krampus is a devilish holiday-themed villain perfect for your Mutants and Masterminds 3E Campaign. The Krampus is fed up with people who "ruin" Christmas, and he's going to do something about it! Who is really beneath that devil's costume? What madcap plan does he have this time? Access the first issue of Rogues, Rivals & Renegades and discover the latest intel! Authored by Jack Norris, and with full color art by Alex Williamson, Denise Jones, and Ruben Byrd, this new super-villain is the first release in our Rogues, Rivals & Renegades series. Starting early in 2015, this series will become a regular product line offering NPCs suitable for dropping into super-heroic campaigns. Each character is designed as a villain, a potential ally with complications, or an outsider who might help the PCs one day and be at odds with them another! Each one has the potential to become a mainstay of your campaign! Rogues, Rivals & Renegades are presented as files from a meta-human monitoring agency called METAs, with a loose frame story connecting them to Vigilance Press's own Beacon City setting. They are designed to drop into any setting with minimal effort, however, and the METAs commentary is written to give you a better picture of each character's personality and threat level. Each issue gives you a background for the character, commentary by METAs agents, a standee to print and play with, and the Hero Lab file for the character! This issue is included as an entry in Rogues, Rivals & Renegades Collection One! Another fun little release from Vigilance Press. While not a major threat, the Krampus is a holiday themed that should make an interesting addition to your M&M campaign. I've enjoyed everything I've purchased from them in the past, and as long as they keep up the quality, I'll continue to purchase products from them in the future. Do wonder why a metahuman monitoring agency is watching and reporting on a tech-based villain who appears to have no specific meta-abilities? Yeah, also if I recall correctly "Blue" is the designator for tech-based abilities that are functionally superhuman. This is not the first e-book I have gotten from Vigilance Press and it will not be the last. And while this villain is kind of a one trick pony his entry was a delight to read. I can't wait to use him in game. This title was added to our catalog on December 14, 2014.